Until The Waters Run Clear is the second Black Casino And The Ghost album, following up on 2013's Some Dogs Think Their Name Is No, and it's a veritable pot-pourri of styles that holds the listener in its grasp as it leads you like a pied piper through a magical mystery tour. The magic of Black Casino And The Ghost is their unpredictability, not for them the traditional song structures and the monotony of verse chorus verse. Their best work feels like they're taking you on a trip through their confused creative minds, itching to constantly move in five different directions at once. Their brilliance is in the fact that this never sounds like a mess it could easily become or contrived and pretentious, they are always engaging, springing a surprise, keeping the listener on edge unsure of which curve ball is coming next. 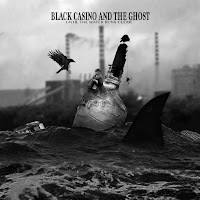 Black Casino And The Ghost are Elisa Zoot on vocals and piano, Ariel Lerner on guitar, Gary Kilminster on bass and Paul Winter-Hart on drums, but what they create feels like much more than the sum of those parts. Take the two singles from the album so far - Age Of Contagion is a brooding dance floor shuffle with a menacing undercurrent of uncertainty whilst Veggie Tarantula with its rock god guitar riff sees them letting loose and creating a cacophony around which Elisa snakes her vocals. That contrast is an accurate pointer of the rest of the record. There's the subdued opener The Pool which builds very subtly, wrapping itself around you with the backing vocals and Elisa's strangely seductive and intoxicating vocal, Cassiopea is a heartfelt simple hand reaching out to a troubled friend, The Puppeteer has the feel of a slightly weird and dark children's song and Bitter Beast feels like there's about five cover versions going on in one song but somehow mixing together into something that could only be them. Lucifer, Lucifer, Lucifer blends a delicious vocal harmony and a dancing keyboard line with the slightly menacing "call his name three times and he will fix you" whilst Soul Mall has drama and tension coursing through it, rising and then dropping leaving you with an uneasy feeling as to what's coming at you next. Sherry is probably the album's highlight, a raucous filthy blues feel "you can pick whatever door you want to sweetie, eenie meenie mo, my words have no meaning" that skips along the tightrope of losing control and descending into madness as it progresses, but balances precariously, does a triumphant twirls and bows out with a sampled vocal that declares "praise the lord". It's a bit bonkers, but absolutely brilliant whilst the insistent Hoochie Coochie Lover sparks and burns a twisted form of romantic pursuit that's both endearing and somehow unsettling. Until The Waters Run Clear is a record made by a band with a million ideas to cram into fifty minutes and who manage to succeed in doing so without overburdening the songs. It's a record that reveals something new, takes another twist on every listen. It demands your focus and attention because there's so much going on, but once you've put it on, you won't be switching it off any time soon. Until The Waters Run Clear is released on November 16 digitally via Black Casino And The Ghost's Bandcamp page.